List of ingredients: Ingredients are always listed from greatest to smallest by how much they weigh (including any added water) at the time they are added to the product. 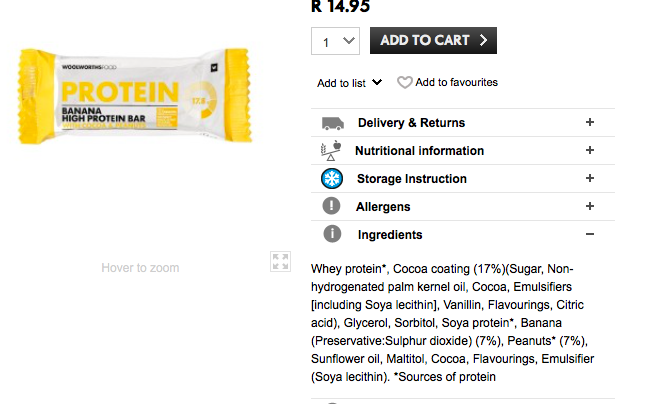 The percentages listed behind these ingredients tell us how much of the total product is made up of that particular ingredient. Not a lot of banana in here is there? Allergens: If you have a food allergy or intolerance this is where you want to pay close attention. Common allergens, including things like egg, cow’s milk, gluten and peanuts, MUST be listed on a product’s packaging. Some food labels say ‘may contain e.g. nuts’. This means that even though nuts haven’t been included in the food deliberately, the manufacturer can’t be sure that the product doesn’t accidentally contain small amounts of them. 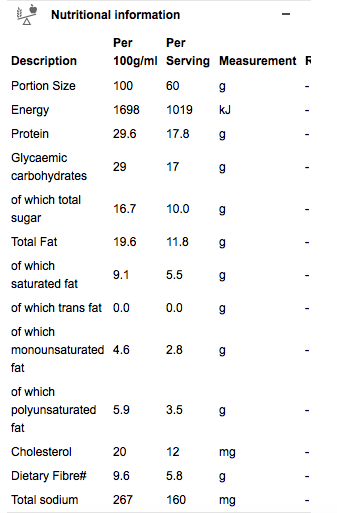 Nutritional Information: A nutritional analysis table shows how much energy, macronutrients (like carbs, protein and fat), fibre and micronutrients (like vitamins and minerals, including sodium) are in your food. 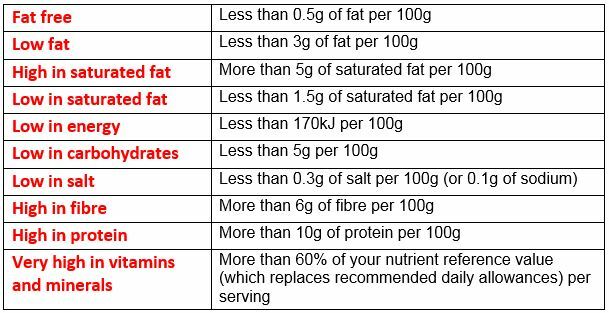 The nutritional table should give you this information per 100g and per serving AND it should give you an indication of the serving size. 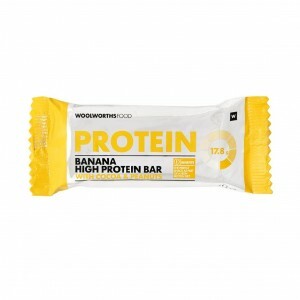 Nutrition information should be listed per 100g or 100ml product and by the recommended serving size. The serving size is the amount of product that is generally used per one serving. Although the package might actually contain several servings, nutritional facts in tables are usually based on just one serving. Always look at the serving size of the product and how many servings you are actually consuming. For instance, if the serving size is 250ml but the pack contains 500ml of product, this means there are 2 servings per pack. Therefore the nutritional information on the label per serving will be 2 times more if the entire pack is consumed. Common food claims and logos: We often see claims such as “Sugar Free” or “Fat Free” listed on products but what does it really mean? Sugar free products are products that contain 0.5g of sugar per 100g can claim, often manufactures counter act this by adding fat or sweeteners to products. “No added sugar” means a product cannot contain added syrups like honey, molasses or even concentrated fruit juice. Remember though, this does not mean that the product did not have a high sugar content to begin with so read the nutritional info! For dairy products its slightly different and the regulations have changed since April 2016. Packaging and labels communicate how we use, transport, recycle or dispose of the package or the product. The label also communicates important properties or info about the product enclosed. We hope this enables you to make even further informed decisions when faced with the barrage food options and target marketing that accompanies a shopping trip to the store. Coach Tash CCF Level 1 & Level 2 Coach CCF Nutritional Advisor This is the 5th in an 8 week series of articles that will help you improve your healthy eating habits. They are meant to be a guide and a support, but just like anything you need to figure out how it works for you.